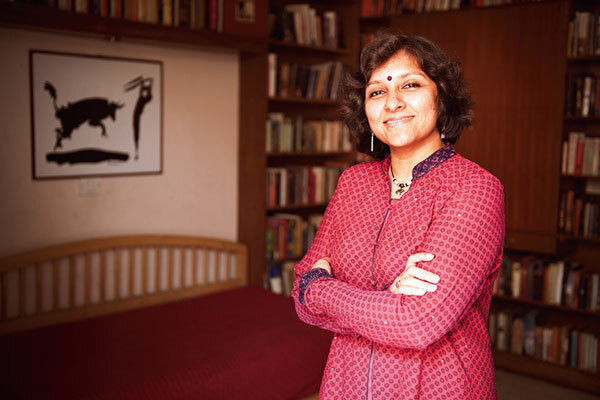 In the field of publishing for the last 15 years, she is now firmly ensconced at HarperCollins India in her role as Chief Editor and Publisher. Always a lover of books – since her childhood – VK Karthika (43) turned a passion into a profession that takes up most of her waking hours. So, when we walk into her home in New Delhi – that is replete with artifacts collected by her globe-trotting husband, Vivek Menon, she is perusing a manuscript on her sofa, even as her sons, Shiva and Shasta, are busy at play in a separate room. In a freewheeling conversation with Verve, she speaks about the changing face of writing in a world dominated by e-entertainment. What are the recent changes you have seen in publishing? A lot more differentiation is happening. Earlier there was a unanimous feeling that fiction was the thing to read and publish. But now there is an increasing number of segments branching out – commercial fiction, women fiction, chicklit, campus novels, adventure thrillers, crime. Interestingly, the fastest growing and most readership changes that are happening are in non fiction. There is a lot of work on current affairs, economics, politics, big-idea books – management is also very, very big as a subject. Were you an avid reader when you were growing up? I was always a reader. But I got into publishing by accident. Today, there is a lot of emphasis and attention on what goes into the making of a book, what goes on behind the scenes, which is really what publishing is all about. Earlier, books just arrived and nobody ever thought about what went on to make them happen. Most of us joined publishing because somebody we knew was there and they influenced us to try it out. Is being a woman in publishing an advantage? I don’t think it’s either a plus or a minus. Writers come to you not because they are comfortable with your gender but because they are comfortable with the kind of work you can do with them. The relationship also depends on how you will get along with them in terms of daily conversation and interactions. There are two sides to my work – you have to be really good with working on their text and bring out the potential of the book as far as you can. And the other part is that you have to be a good ‘sounding board or friend’ or the ‘middle point’ through the entire process before publishing a book. You don’t have to be what the author wants you to be but you have to try and get under the skin of that particular book and the particular style of that writer, and that could be very different from the other thing you are working on simultaneously. How much of your personality intrudes into the editing? In a sense, editing is all about being neutral, appreciating what you have got and not necessarily imposing what you think on it. It’s more like saying this is where the writer wishes to get and can I help him get there. It’s not about me but about that person and that book and that’s really the bonus of the whole thing. You are working with some of the brightest minds in the country, if not the world. I would have to say I enjoyed a lot of young writers a great deal. Like Sarnath Banerjee, Rana Dasgupta, Anita Nair and many more. From every book you get a little more on the person. This is a relationship that never ends; it just matures over the years. And, of course, there is the moment you discover something a first-time writer has sent you. You fall in love with the manuscript on the table and getting to know that person does seem exciting. What makes you realise that a particular manuscript is going to make it? Here, I look at myself as your average reader, located in this time, in this place, in this country. If something grabs my attention and holds it for those 150-200 or 300 pages, then there will be a few 1,000 people like me who will possibly feel the same way. So, it’s just a feeling. The power of rejecting authors is vast. What happens when you exercise your veto? Some of the authors are usually quite unhappy with the decision, so they tend to come back. Rejections normally happen only at the level of the unsolicited manuscripts really. When a manuscript you are not happy with comes in from an agent or someone you know, you would tend to not reject it, but you will end up making an offer that is not good enough or that’s not high enough. So, at a certain level you say no gracefully. After reading so many manuscripts at work, do you read other books at home after work? I have to. It’s a great joy reading something that I am not responsible for – the errors, the typos, anything that has gone wrong! Do you think the younger generation still reads as much as youngsters did in previous decades? I think youngsters continue to read because that’s just a part of our culture. You have to tell stories and you have to listen to stories. Then you shift from reading a page to reading it on e-Reader. I don’t think we should make a fuss about reading it on a page or e-Reader/online or listening to it as an audio book. It’s the content that we should be worrying about and not so much the form. I think we spend too much time analysing whether or not kids read a book and is it okay if they read other things. They are obviously very passionate about reading other things. I think we should think about enjoying that change and how we can make that even more interesting. What has caused the promotion bandwagon to take over publishing? It is because the times are like that. There is just so much in the store. There are so many books at any point of time in the display that unless you give them the hype to back and poke people to buy it, you will be left behind. So you just have to make sure that your books stand out for a lot more reason than the others. Also, people want to see the writer as well. It’s almost that because I like the writer, I will read the book; so there is a lot of personal promotion that is required to be done. It is all part of the job now.